Last week I bought one of those new Raspberry Pi computers. It is a small single-board computer about the size of a deck of playing cards. 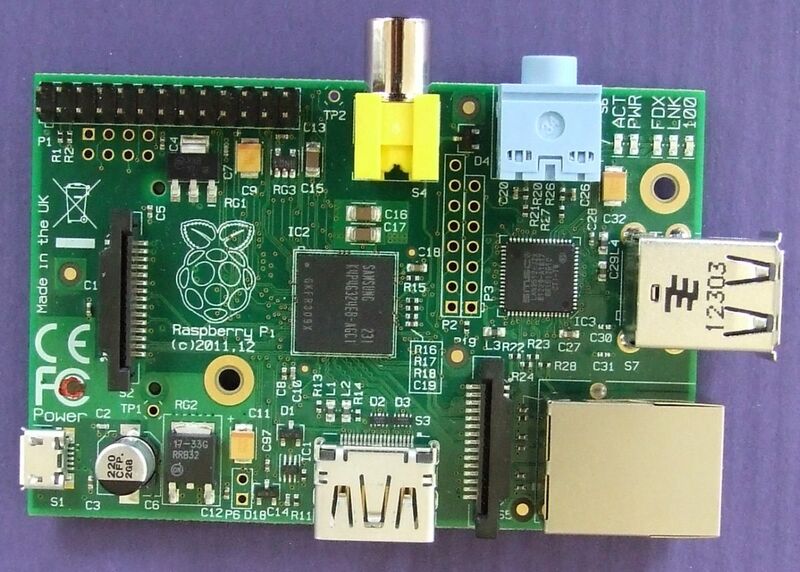 It was developed in the UK by the Raspberry Pi Foundation with the intention of making a cheap computer to be used in schools for teaching about computers as opposed to teaching about Word, Excel and other applications. There are two main versions. The one I got (and I think the most popular) is the slightly more expensive Model-B which I bought in Australia for about $38.00 (without SD card). 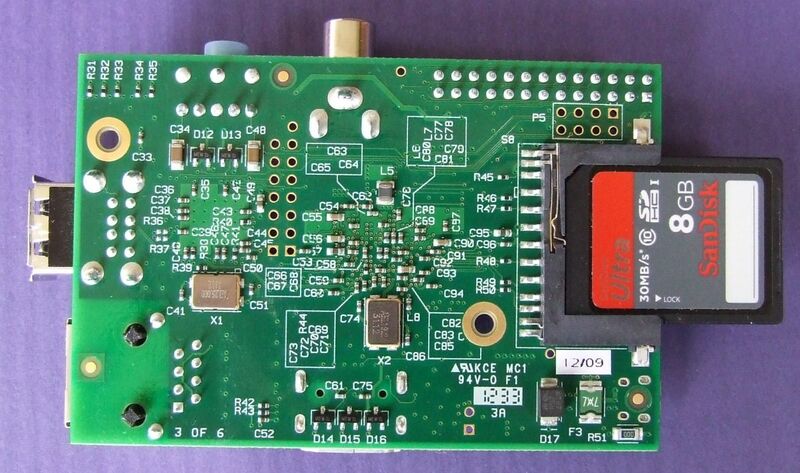 While it doesn’t look like it could do much it has a 700MHz ARM processor with 512MB inbuilt RAM (like those used in some mobile phones), 2 x USB ports, composite video output, HDMI output, a 3.5mm audio output, a SD card slot, an Ethernet socket and a micro USB socket used to connect a 5v power supply. It can run Linux (I have a version designed for it called Raspbian) which is installed on a SD card. All that’s needed to start off is a keyboard, mouse and screen (a TV will do) and a connection to the internet (I use a USB wireless network card). The other thing it has of interest is a GPIO (General Purpose Input Output) header that lets you connect sensors and other things. Here it is with the retail packaging. The SD card was purchased separately. The first thing that stood out is the box. It looks like a box of tablets. I opened it up and removed the small circuit board and spent the next 15 minutes admiring it and passing on all the “interesting” facts I knew about it to my wife until I thought she could take no more. The next day when I had more time I inserted the SD card, connected my phone charger as a power supply, a keyboard and wireless mouse and the TV via a HDMI cable and switched it on. Lots of text came up on the screen followed by a prompt for a username and then password. I read the instructions that came with the SD card that I bought on ebay and got the Linux GUI desktop running. I felt like I did when I got my first Commodore 64 computer. I was excited that I could get it to boot and realised that there was so much to learn. Eventually I got an old USB wireless networking stick to connect to our network so I can put that LAN cable away again. The thing that is perhaps the most exciting other than the value for money it offers is the potential it holds for hobbyists. Already there is a community sharing tips and project ideas. They are cheap… cheap enough that money is not really a reason to avoid using them. Cheap enough that it doesn’t matter if you destroy one and cheap enough that you can buy a few if you want to have several projects going. So what are my plans? I’m finding the learning curve is a bit steep at the moment and I’m not very confident that I can get very far with it. Initially I want to get it to run as a server and be able to log into it remotely. Next I would like to see if I could connect a sensor or two – maybe a seismic sensor and be able to monitor that remotely. After that I would like data from the sensor to be stored and remotely accessible. Posted on October 28, 2012, in Computers, Electronics and tagged computers, electronics, Linux, Raspberry Pi, Raspbian. Bookmark the permalink. 3 Comments. How long did it take for it to arrive to you. I’ve been meaning to get one for ages, but with the high demand, I wasn’t sure whether it would be worth buying it directly. I actually ordered two. The first from RS Components and their delivery time was December and it has not yet arrived. 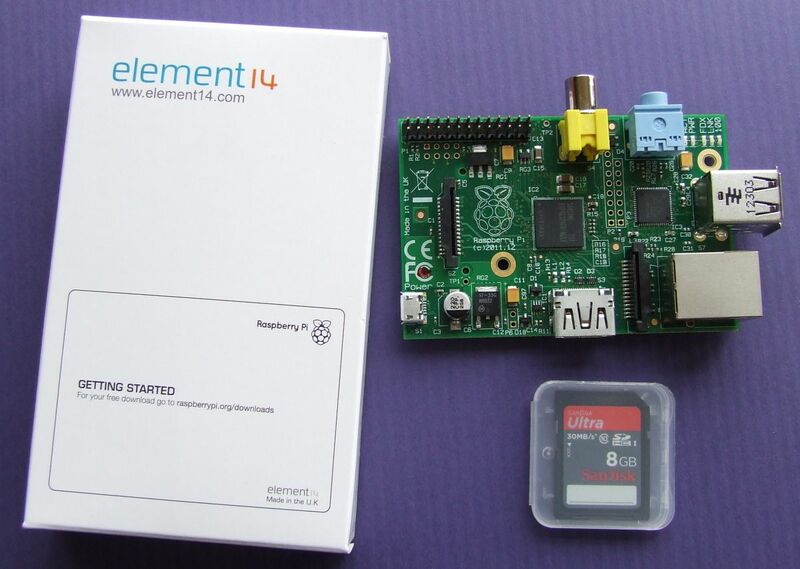 Just after I put in the order I read that the default RAM on the Raspberry had jumped from 256MB to 512MB so I checked the Element14 site http://au.element14.com/raspberry-pi/raspbrry-modb-512m/sbc-raspberry-pi-model-b-512mb/dp/2191863 and they had about 1400 (I think) in stock. I put in an order and it arrived within 2 or 3 days. It looks like they still have 155 in stock, so they are selling fast.